Find artworks, auction results, sale prices and pictures of Frederick Rickeman at auctions worldwide. 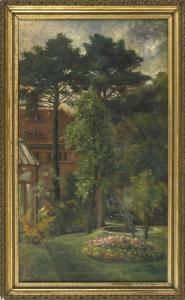 Description: FREDERICK RICKEMAN American, 1874-1951 View of the Mystic-Noank Library Garden. Signed lower right "F. Rickeman". Oil on canvas, 39.5" x 19.5". Framed 40" x 24".